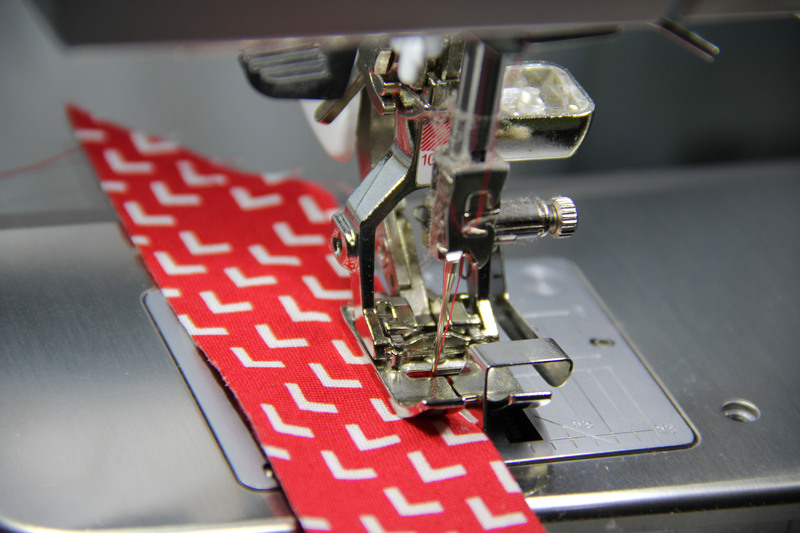 Maybe You Stitch on the Edge Too! An edgestitch is exactly what it sounds like. A stitch on the edge. 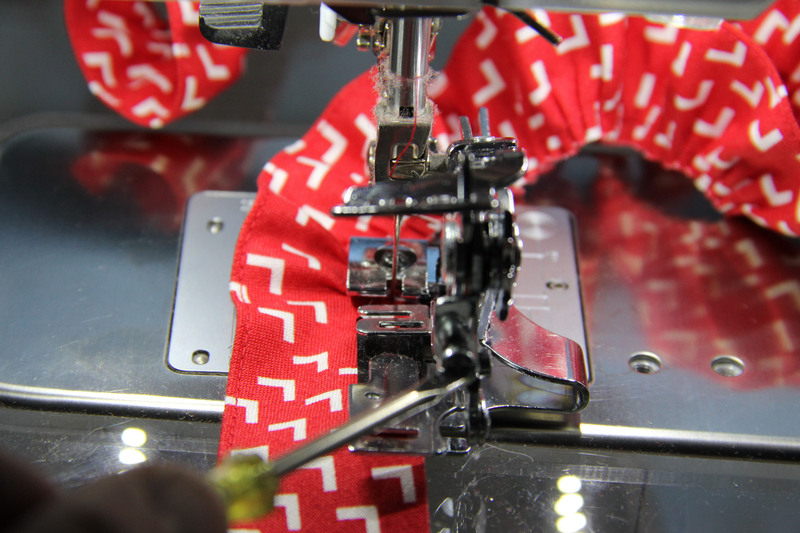 Most sewing machines have a specific foot for this purpose and Bernina’s foot #10D is, of course, one of my favorites. 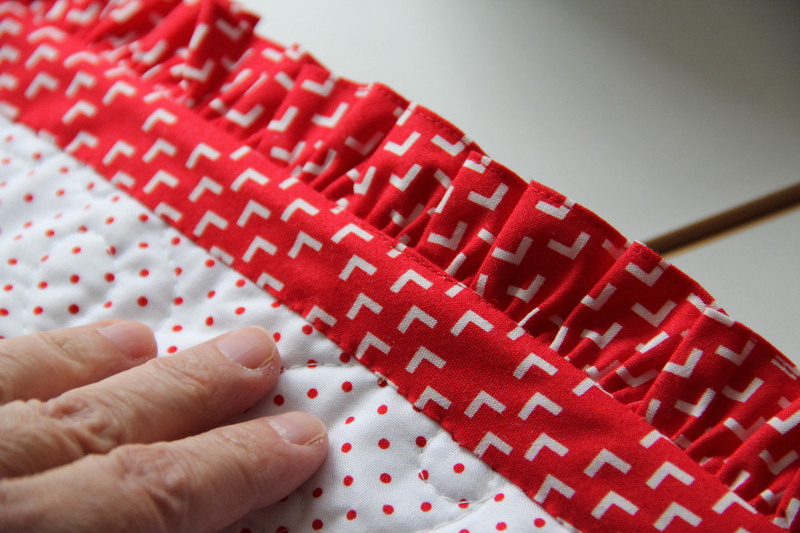 On the way to sewing this baby quilt I decided to add a ruffle. So I cut 2 1/2 in. strips as you would for bias binding. Only I needed twice as much to form the ruffle. Because I wanted the ruffle to last through many washings, I decided to add a stitch right on the edge of the fold prior to ruffling. I moved the needle 2 points over to the left, to stay just inside the fold. Next I started to ruffle. You can see I am adjusting the ruffler to get just the right amount of “bite” so that the ruffle isn’t too curvy, but also not too flat. You can see the edgestitch along the left, on the fold. In general, when creating a ruffle, you need your length of the ruffle fabric to be twice the length of the fabric it will cover. 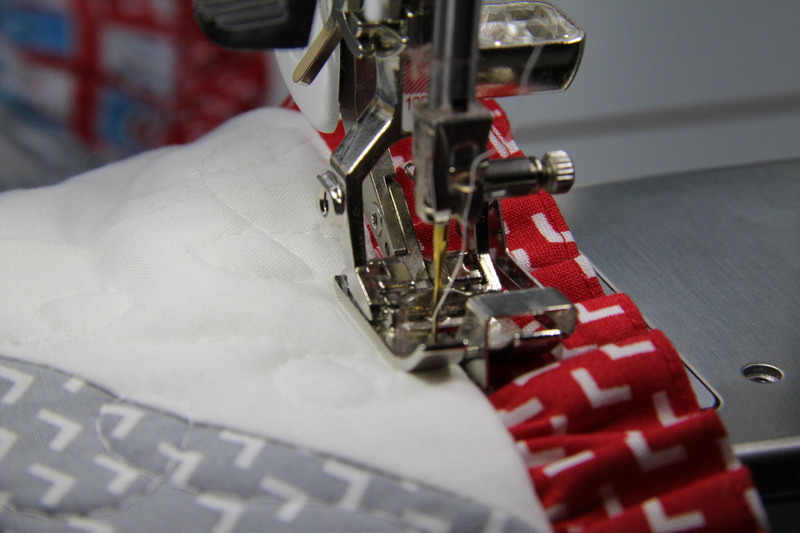 Next, I attached the binding over the raw edge of the ruffle and the raw edge of the quilt. It naturally wanted to turn itself with the ruffle on the outside, so I went ahead and did another edgestitch along the top front of the quilt. The binding lays flat underneath. 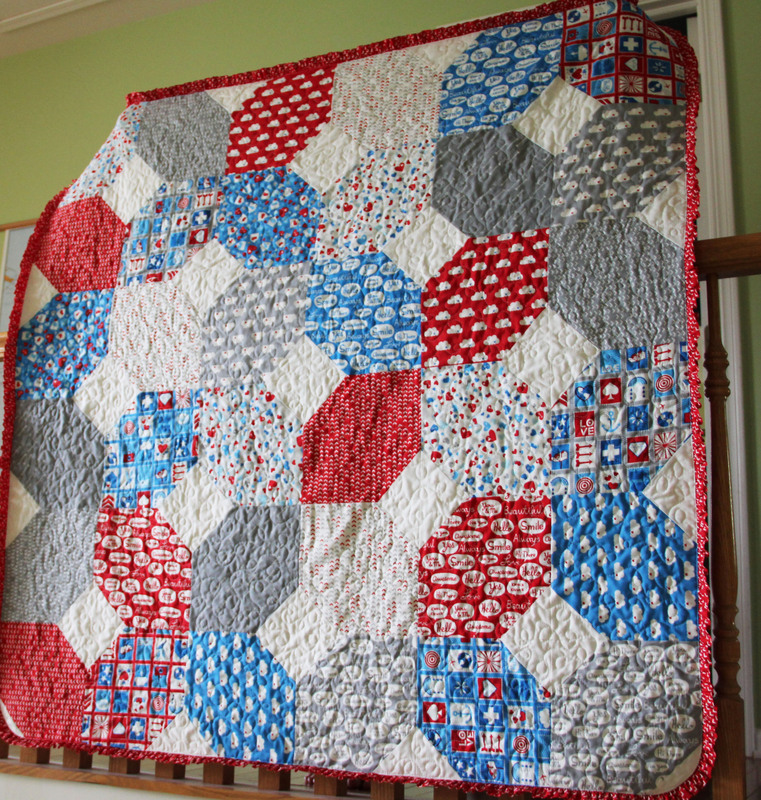 The whole thing was only possible because I have rounded corners on the quilt…no miters. And I used a bias ruffle and a bias binding. Isn’t that a gorgeous edgestitch? Nothing like having the right tool for the job. Now all I have left to do is to hand-stitch the binding on the back. 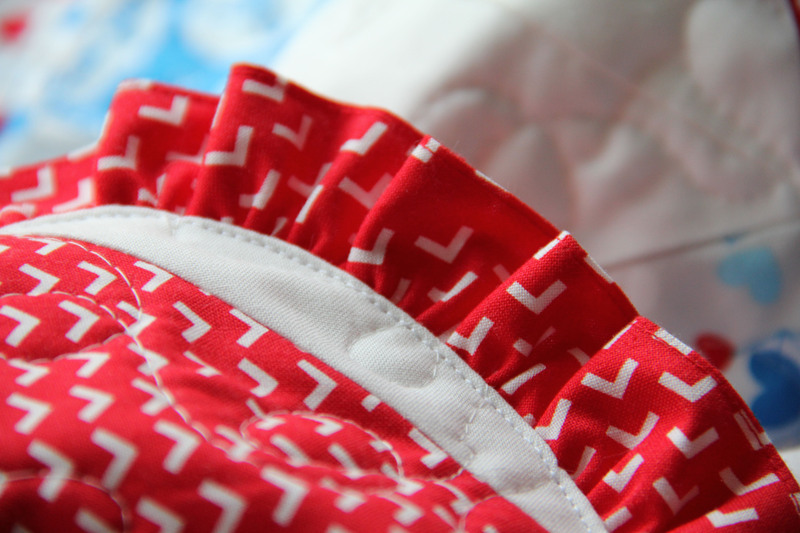 The binding is longer than usual because of the way the ruffle is attached. Now all we have to do is wait for the baby.